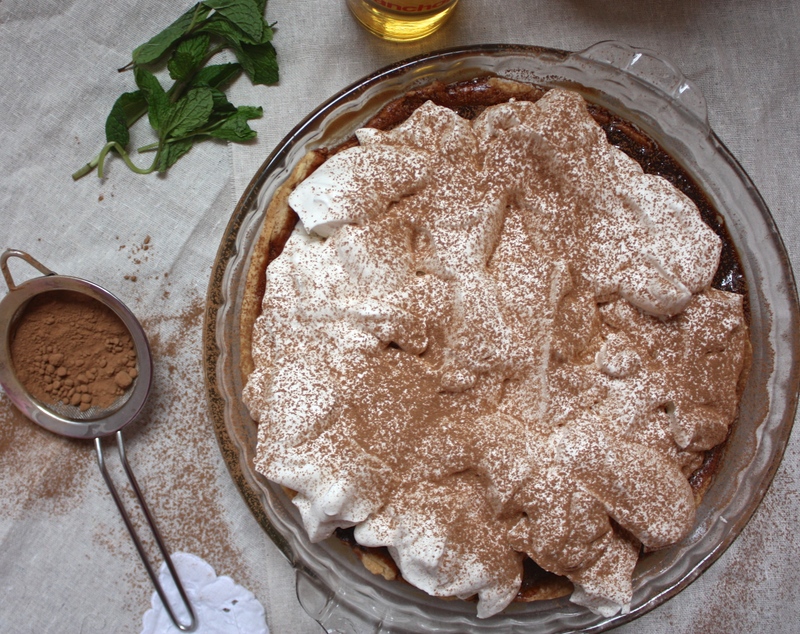 This pie was inspired by my favorite St. Patrick’s day drink – an Irish Coffee. A little whiskey and Irish cream never hurt anyone! It’s how me and J would start our weekend mornings in the beginning years of our friendship in college. So you’d say it holds a special place in my heart. 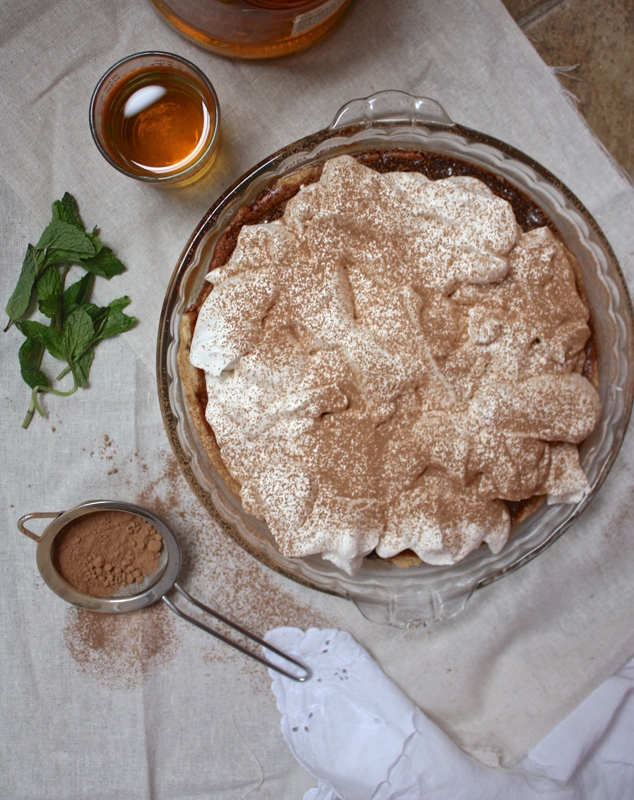 Since I’m not drinking, and decided to quit eating processed sugars, I’m celebrating St. Patrick’s day making a pie inspired by the some of the same flavors and techniques as the drink and this fresh mint ice cream that I loved all last summer long. I infused the milk and cream with fresh mint, but by all means use the extract if you prefer a more potent flavor, but I either always have to much of it growing in the garden or dried in jars. 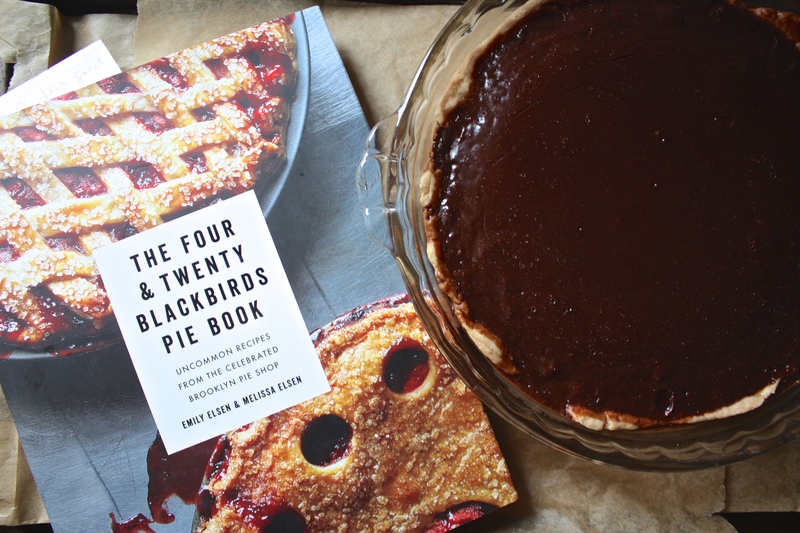 Getting The Four & Twenty Blackbirds Pie Book in the mail seriously made my afternoon. 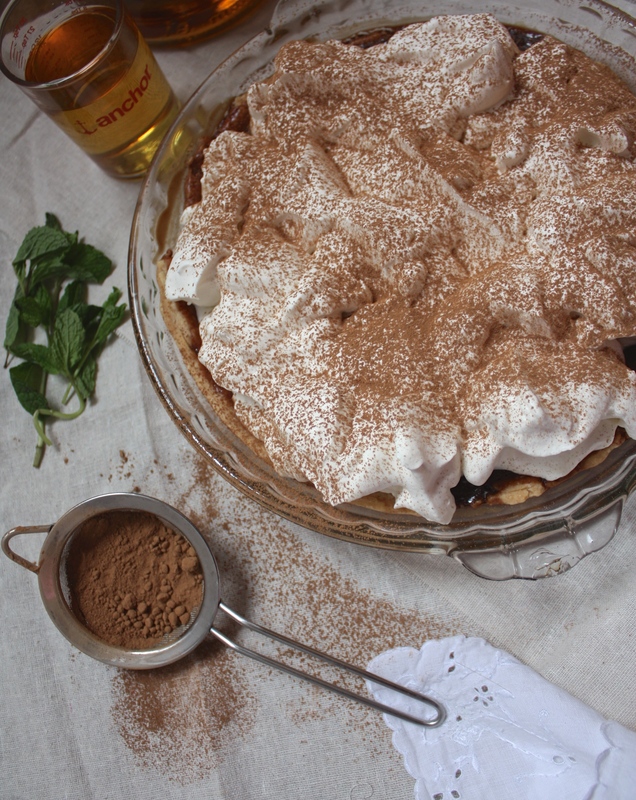 Wanting to get my pie season started, in time to entice you guys to place some orders for warmer lazier days. 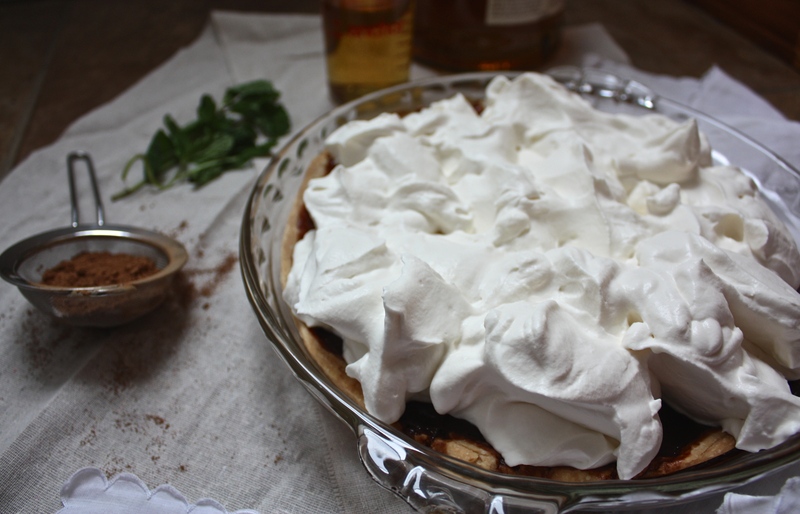 And with St. Patrick’s day I knew their chocolate julep pie, inspired by the signature Kentucky Derby mint julep, would become the inspiration for my own chocolate and whiskey pie creation. There’s a funny story about this whiskey. The “good stuff” according the my dad. It was two days before this past Thanksgiving and I was sitting at the kitchen table cutting apples for my apple pie, drinking a Pumpkin brew, and my leg propped up, since it was sore from therapy that day. My dad walks in from work to this sight, and before anything realizes the whiskey bottle I had next to the pile of apples. I was only going to use a few tablespoons, but this stuff was “too good” to be baked into a pie? Really, could I have better taste in drinking Whiskey than my father. 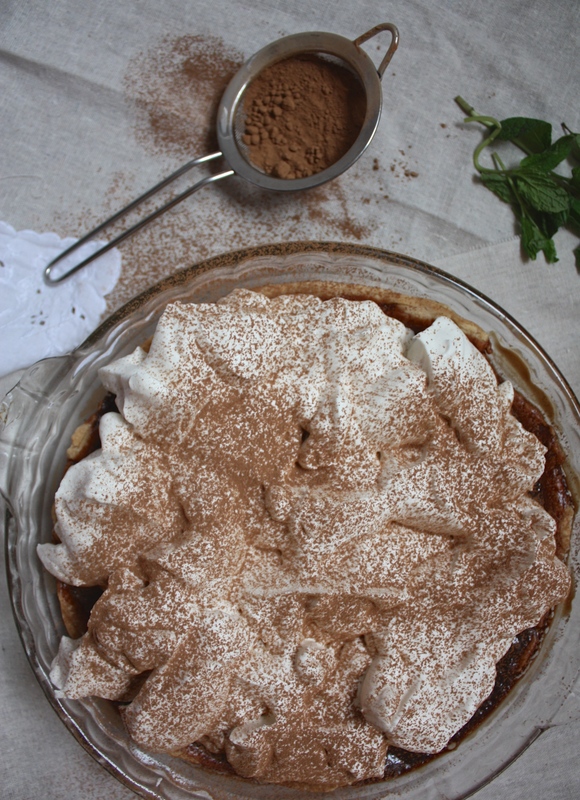 Then there’s the mounds of Bailey’s spiked whipped cream. I don’t like mine sweet, which means I didn’t add any sugar to this one, but feel free to adjust the sweetness to your liking. For me the lack of extra sugar in the cream, along with its lightness, was exactly what the dense and rich chocolate pudding layer needed. This whipped cream made me realize that if you’re an avid baker or cook, you should have a great quality stand mixer, I highly suggest a KitchenMaid, and a handheld mixer for times when you need to just quickly whip something up. Using mine reminded me of baking in Portugal with my grandmother, and her cooking on her amazing old style wood burning stove, which I then saw a decor remake later in the day with J at Williams-Sonoma. I can’t wait to go back this summer and bake some goodies and teach her the ways of a classic pie. The chocolate is dark and bitter. Just how I like my chocolate. But again use whichever makes your heart sing. Yes, that’s whiskey in a measuring cup. Suitable drinking glass don’t you think? To all Irish women and men, and non-Irish who will be celebrating this St. Patrick’s day grab a beer, sing some fun folk songs to bands playing outside, and cheers to good times. 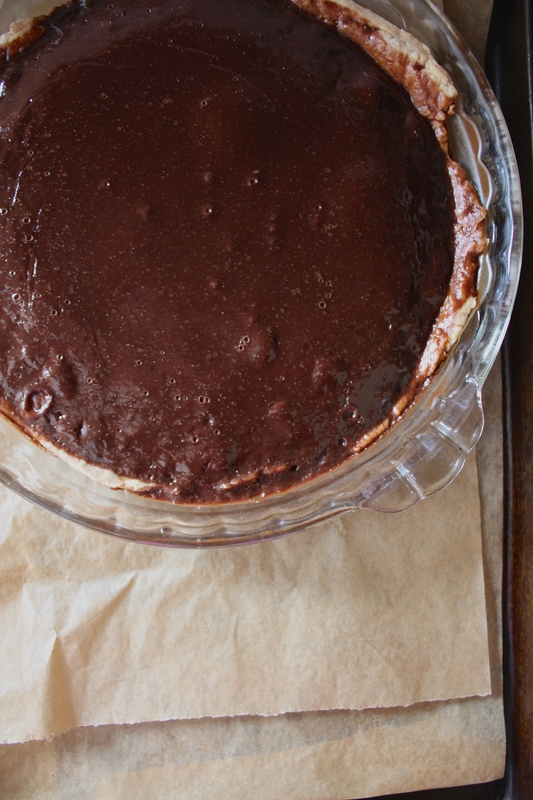 And maybe this pie. Pre-heat oven to 325* degrees F, and place pre-baked pie shell on parchment lined baking sheet. 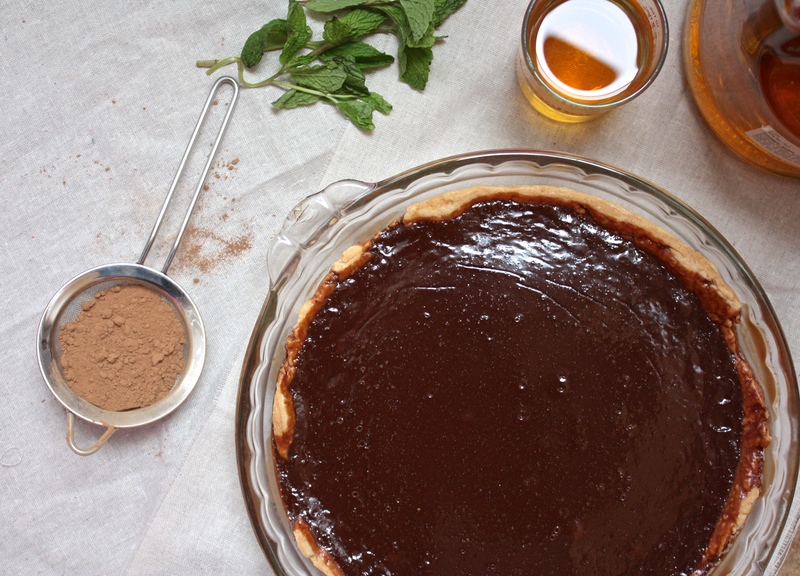 Place the chocolate into a bowl, set aside. Combine the milk, cream and fresh mint in saucepan, bring to just a boil. Remove from heat, place cover and let steep for 5 minutes. Pour hot cream through fine strainer over chocolate, and let stand for 5 minutes. 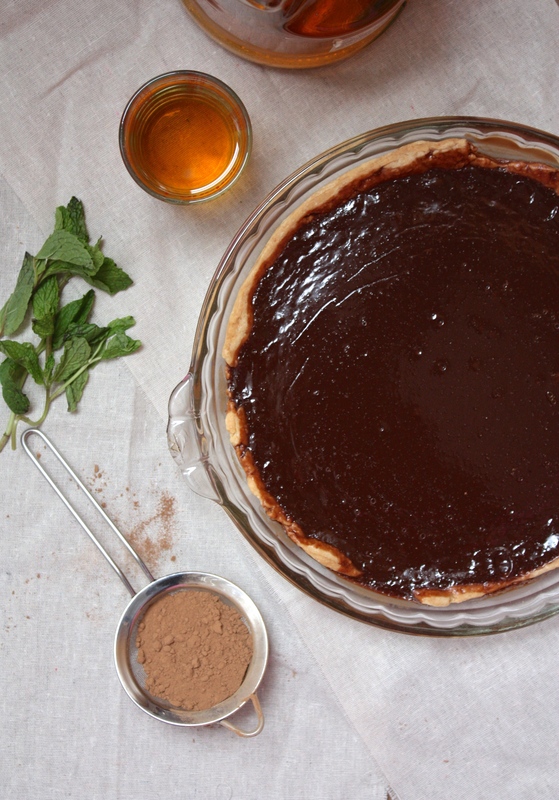 Stir in the salt, and whisk until chocolate is completely melted. In a bowl, whisk the eggs and slowly add in a small amount of the chocolate, whisking to make sure the eggs don’t curdle. 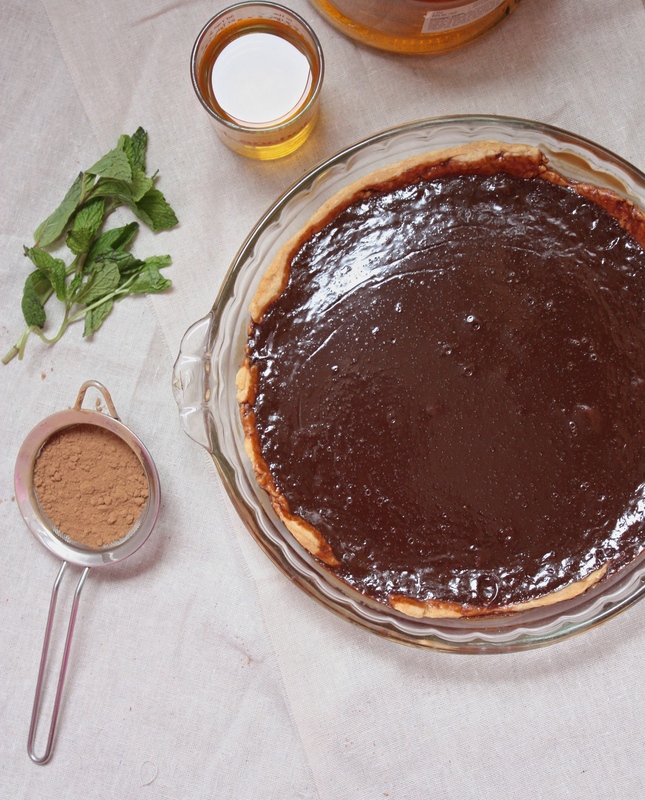 Add a bit more chocolate until the eggs feels warm and mix mixture back into the chocolate. Stir in the extract, whiskey to taste and whisk until smooth. 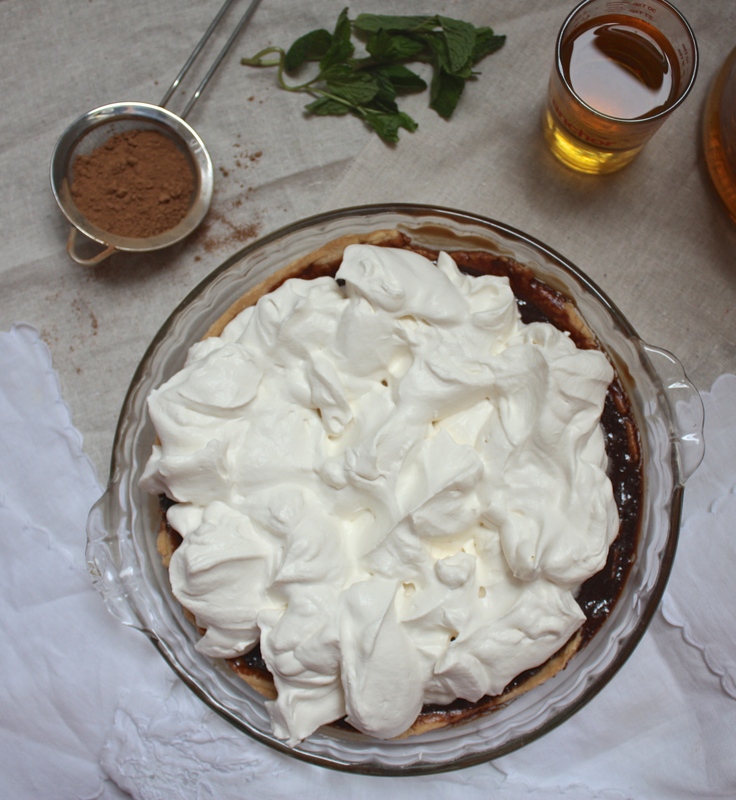 In the bowl of an electric mixer, beat the cream to soft peaks. Add in the Bailey’s and vanilla, and beat to stiff peaks. 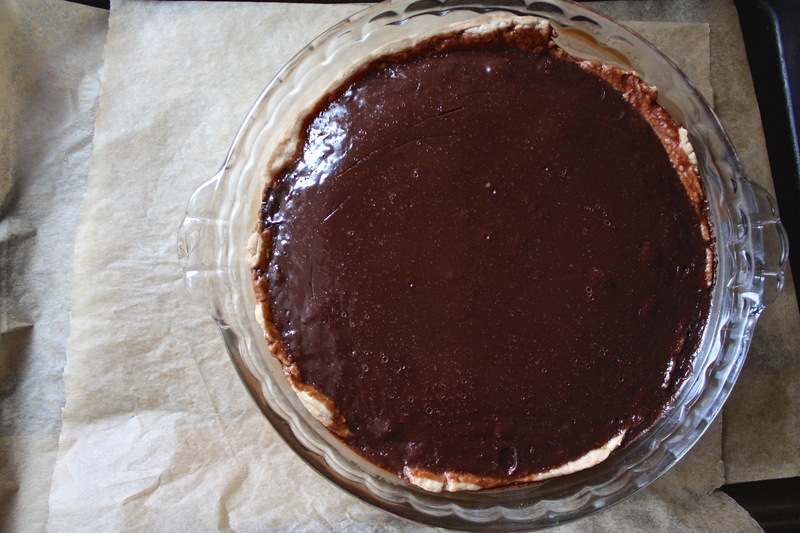 Top cooled pie, or refrigerate in an airtight container.